UMP | University of Minnesota Press Blog: At Spoonriver Restaurant, excitement, a happy and healthy community, and awesome local food are all in a day's work. At Spoonriver Restaurant, excitement, a happy and healthy community, and awesome local food are all in a day's work. It’s just after lunch-rush hour at Spoonriver Restaurant, and when I arrive the place is hardly at a lull. Satisfied customers are casually hanging out. Staff are conscientiously attending to their needs. And beloved local chef and founder of the Mill City Farmers Market Brenda Langton is itching to show off a photo from local farmer Andy Rider—of a single morel mushroom that stacks higher than a soda can. “You can’t believe for a minute the morel you’re going to get. Two of them make a pound!” she exclaims to familiar customers. She’s never seen morels like this. For someone who’s been in the business as long as she has, that’s saying a lot. Langton is a conscientious purveyor of all things local and organic, and has been so since the age of 15. She moved from Commonplace Cooperative Restaurant (formerly of St. Paul) to her own Café Kardamena in St. Paul, to Café Brenda in the warehouse district, to Spoonriver Restaurant, which handily sits right next to the Mill City Farmers Market, opening for the new season on Saturday. Despite her business’ booming success (“The recession never hit us!”), she’s quick to say she hasn’t gotten to where she’s gotten alone. It’s her community that makes the restaurant special. This sentiment is translated to action right before us. As we talk and order food, Langton is peppered by very nice compliments from friendly regulars, requests for cookbook autographs, quick questions from staff, and recurring summons from her phone. She manages to handle everything with expert ease and her full attention, never appearing overwhelmed. Before I know it, more than an hour has passed. Within this time, I manage to be introduced to several of Langton’s longtime colleagues, including chef Chris Bundy, whose forte is the fish; Heather Reynolds, who will be demonstrating at the farmers market tomorrow with her daughter and who has been whipping up vegetarian creations with Brenda for at least 10 years; and Liz Benser, “chef extraordinaire,” who has been with Brenda for more than 25 years—together, they’ve served approximately 1,000,500 meals. and the Commonplace veggie burger. Yum! able, happy environment. 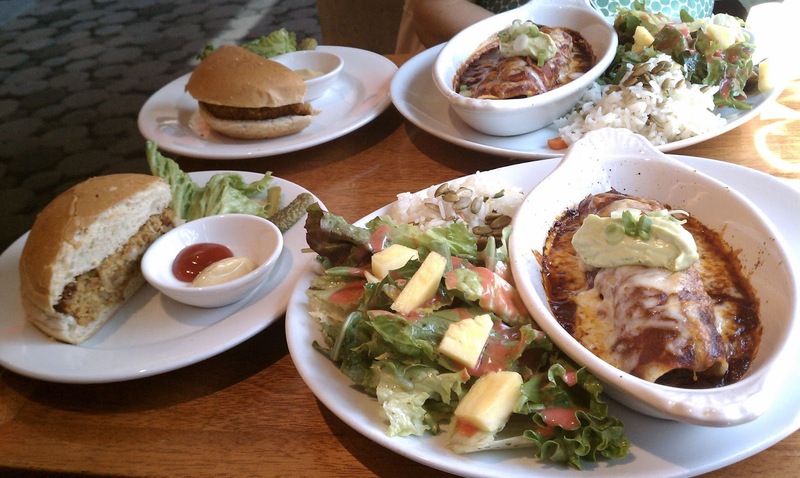 Not to be trite, she says, but food created with a good vibe is very important—and critical to making the community, staff and customers alike, happy. Without this community, she says, the restaurant and The Spoonriver Cookbook would not be possible. 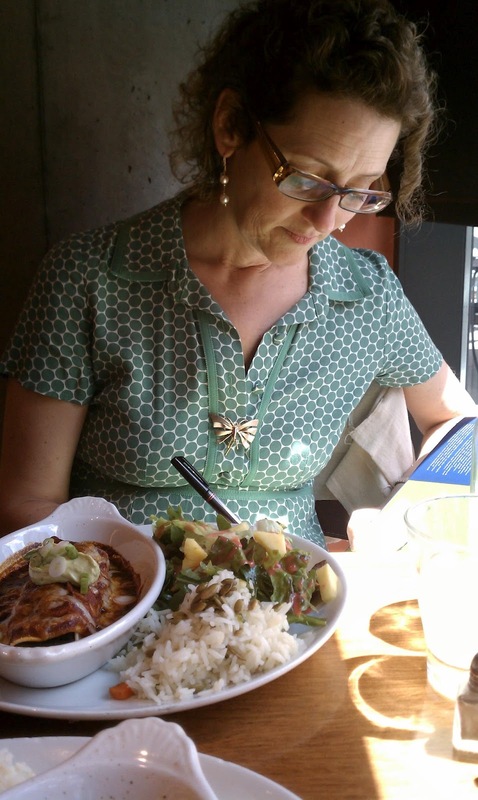 (The Spoonriver Cookbook) is intentionally simplified from the Café Brenda Cookbook. I really wanted to cut out any step, or any ingredients, possible. Really, it’s my job to inspire people to want to get into their kitchen. So again, the simplicity is very intentional. Of course there are recipes in here that are not real simple, but I really tried to put a lot, lot of recipes in here that are very simple. I really love the chapter on whole grains, beans, legumes, vegetables, just very simple combinations of two or three vegetables that are beautiful together and make the meal extra special with hardly any more work. 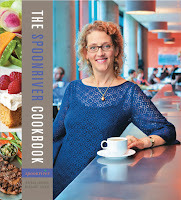 The Spoonriver Cookbook recipe you should make right off the bat: Broccoli and Squash Saute over Couscous. The Spoonriver Cookbook recipe that might be challenging but no less rewarding: White Fish with Persian Nut Crust and Yogurt Mint Sauce. Dressing up a plain beer: I ask about Brenda's recent feature in Minnesota Monthly (Granola Glitterati) in which she pours a shot of yuzu juice into her beer. Curious, I’ve tried to find it myself to no avail. “Get it at Surdyk’s,” she says. She also recommends mixing kombucha with beer: 1 part kombucha (or more) to 3 parts beer. Hosting? Tips for presentation: Pay attention to height, texture, and color, sometimes going that extra step to plating a meal for a dinner party instead of serving family-style, which “gives it something extra.” Also: incorporate fresh herbs. 1) Wash the green onions and remove the roots. Chop the green onions, including the greens. 2) Spread 6 tortillas with a generous 2 tablespoons of sour cream each. Sprinkle the green onions and herbs on top, then add the salmon slices. 3) Place a second tortilla on top of each prepared tortilla. Brush the top tortilla with olive or vegetable oil. Turn the quesadillas over to brush the bottom tortilla with oil. 4) There are two options for cooking the quesadillas. You can cook them on top of the stove in a skillet over medium heat, or place them on a cookie sheet in a preheated 350-degree oven. Turn the quesadillas after 3 or 4 minutes and continue to bake for another 3 or 4 minutes. The tortillas will be golden brown and the insides heated through. Brenda Langton has been a presence in Twin Cities dining since 1972. She started her first restaurant, Cafe Kardamena, in St. Paul in 1978, and then moved it to Minneapolis and renamed it Cafe Brenda in 1986. Cafe Brenda operated until 2009. In 2006, Brenda opened Spoonriver and founded the Mill City Farmers Market. She is a senior fellow at the Center for Spirituality and Healing at the University of Minnesota and an educator and consultant on healthy eating. Margaret Stuart is a horticulturist, landscape designer, and personal chef who has been cooking natural foods since her late teens. Langton and Stuart are coauthors of The Spoonriver Cookbook (2012) and The Cafe Brenda Cookbook, first published in 1992 and republished by the University of Minnesota Press in 2004. Find out what's happening this weekend at the Mill City Farmers Market's seasonal opening. -On Wednesday, May 16th, Magers & Quinn is hosting a recipe tasting and book signing. -On June 7th, the Mill City Museum will host a "farm to market" discussion with Brenda and Atina Diffley.